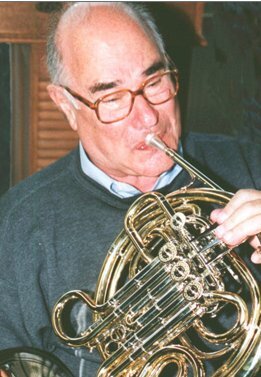 Myron Bloom is a distinguished performer and teacher, known particularly for his tenure as principal horn with the Cleveland Orchestra under George Szell. He has been professor of music at Indiana University since 1985. Bloom attended a concert with his parents at age 12, under protest, with no interest in music, and walked out of the concert featuring Emanuel Feuermann playing the cello knowing that he wanted his life to be in music. All his life, he was imitating Feuermann and Casals, and his true love was the cello.However, Myron's father encouraged him to play the horn as the war was coming and he needed to get in a band or be shipped to Japan. Myron first began on trumpet, then studied horn with Marty Morris (Cleveland Orchestra), who later was in the section with Myron. Myron studied with Arkady Wygoodkin at Eastman for one year, then went to New York to study with James Chambers. He played in the Navy Band in Great Lakes, Illinois during the war, where he met cellist Frank Miller (always the cello link!). Bloom was principal horn in the New Orleans Symphony (1949-1954) before joining the Cleveland Orchestra (1954-1977). In 1977 he was principal horn of the Casals Festival Orchestra in Puerto Rico and then at the invitation of Daniel Barenboim became principal horn of the Orchestre de Paris (1977-1985). In addition to his current teaching at Indiana University, Bloom has taught at the Curtis Institute (1982-2001), Carnegie Mellon University (1993-2001), Cleveland Institute of Music (1961-1977), Oberlin Conservatory, Juilliard School of Music, Boston University, and the Conservatoire National Superieur de Music de Paris. Bloom has been a member of the Marlboro Music Festival from its inception. He has been a jury member at the International Geneva Horn Competition and juries in Canada. He has performed with the Budapest Quartet. His recordings include Strauss Concerto No. 1 with Szell and the Cleveland Orchestra, Schubert's Auf dem Strom and the Brahms Trio, along with Cleveland Orchestra and Marlboro Music Festival recordings. He has influenced the design of Hans Hoyer horns and Houser mouthpiece rims. Bloom received the Punto Award at the IHS symposium in Bloomington IN in 2003 and was elected an IHS Honorary Member in 2014.